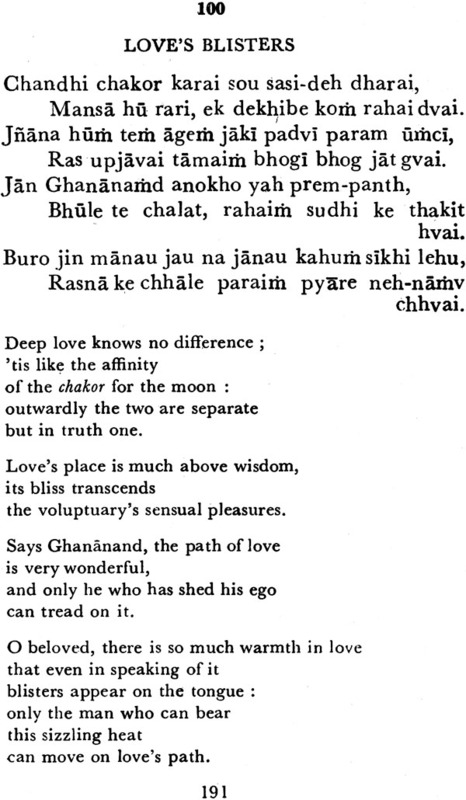 The poetry of Ghananand depicts love is all its aspects. Breaking away from the orthodox poetic traditions he gave Hindi poetry spontaneity and freshness and brought it nearer to life. He fell in love with Sujan a courtesan in the darbar of emperor Mohammad Shah. Having refused to sing when asked by the emperor he agreed when requested by her. The emperor banished him from Delhi for his fault and he left broken hearted for Mathura when Sujan refused to accompany him. 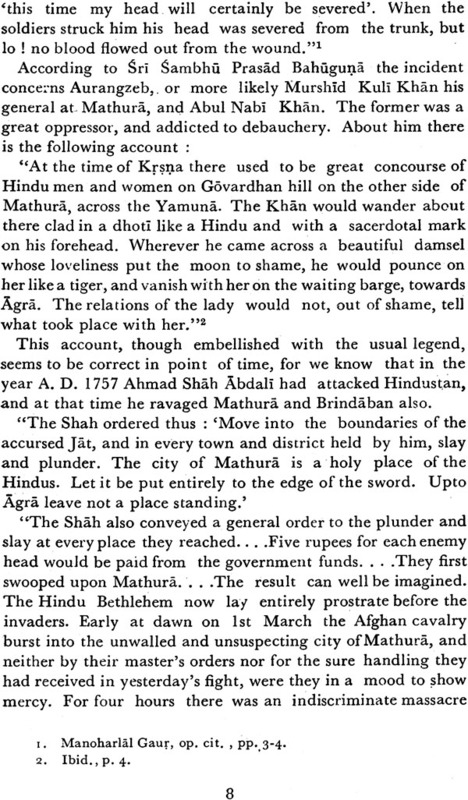 He lived on in Mathura till his death in the general massacre ordered by Ahmad Shah Durani. 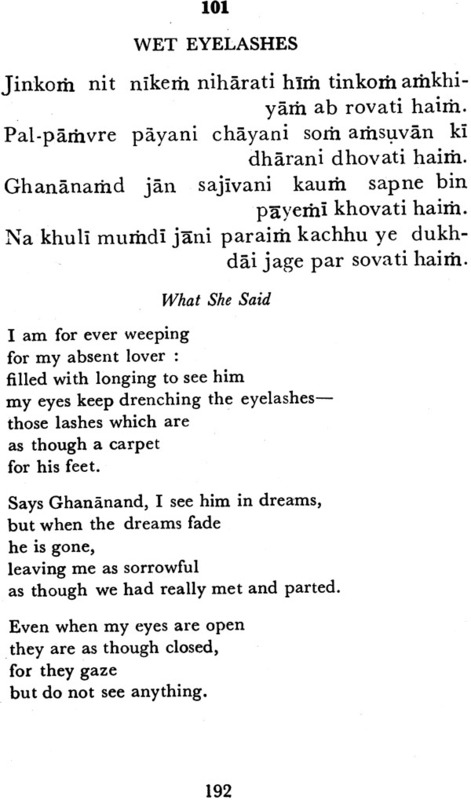 Ghananand’s descriptions of the meeting and separation of lovers are the noblest reaches of Hindi love poetry. Neglected in his own times he has in recent years been given the recognition he deserves as one of the outstanding poets of Hindi love poetry. K.P. Bahadur who is a senior officer of the Indian Administrative service has distinguished himself by writing a number of books on philosophy, religion and other miscellaneous subjects. Four of his other works have been approved by the Unesco in the Indian translation series the Ramacandrika of Kesavadasa selections from Ramacandrika. The parrot and the starling and one hundred rural songs of India. Sri Bahadur is a versatile writer. He is equally at ease in fiction and non fiction. Sources of Study- we do not find any systematic account of the life of Ghananand, but none the less the little we learn about him from scattered couplets of his verse and such other sources, points to a life meaningful and interesting. The first reference to him is in Garcin de Tassy’s work Histoire de Histoire de la literature hindoue et hindoustanie (Paris, 1839-47) . 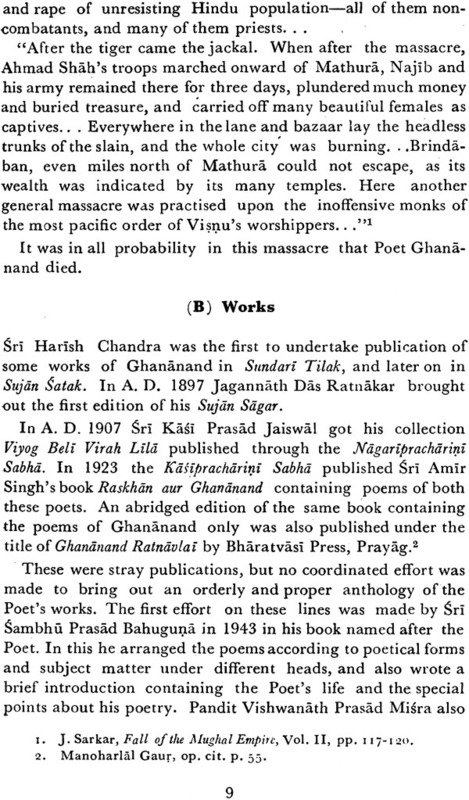 In this we find mention of a poet of the name of Anand, who was a composer of popular songs. It cannot conclusively be said if he is our Ghananand, or some other person. 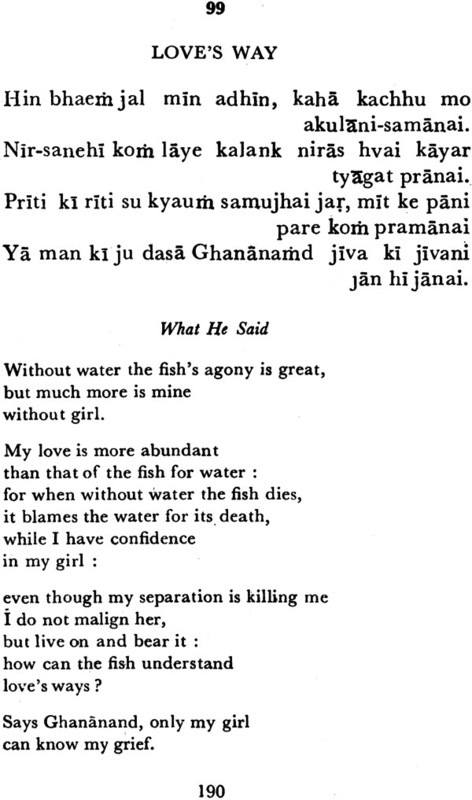 Perhaps the popular songs mentioned in the book were poems written by Ghananand, and perhaps not. Writing about Ghananand in The Modern Vernacular Literature of Hindustan ( Calcutta, 1889), Sir George Grierson says that he was by caste a Kayastha, and the scribe of Emperor Bahadur Shah. Before his death he had left his job and gone away to Brindaban, where he was killed in the attack of Nadir Shah on Mathura. 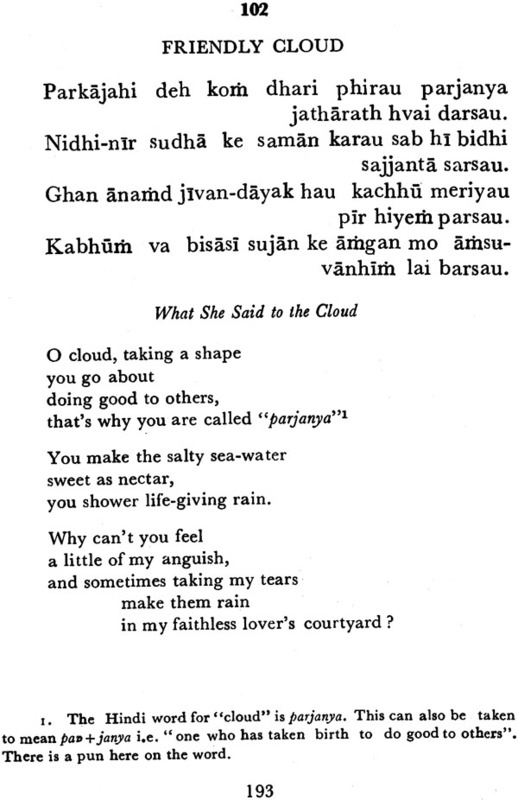 He also mentions that sometimes the Poet used to write his name as Anandghan. 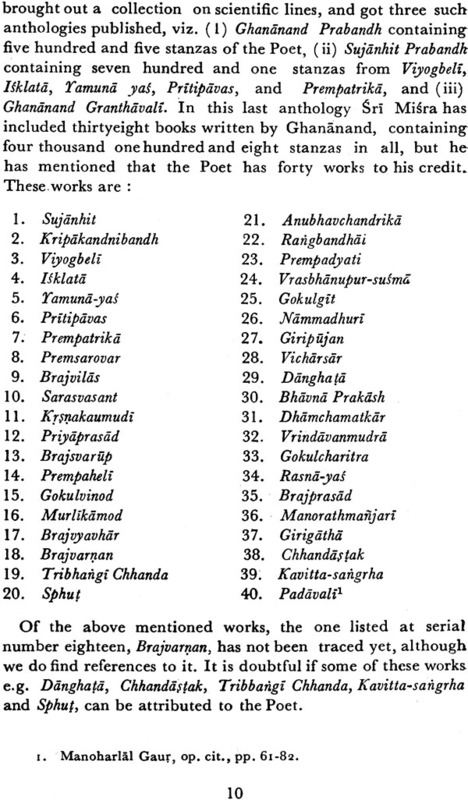 "One day some flatterers told the Emperor that the chief scribe, Ghananand, sang very well. The Emperor asked him to sing, but he made excuses and would not do so. Then some persons said that if his beloved, Sujan, who was a courtesan, made the request, he could not refuse her. The courtesan was summoned to the royal court and true enough Ghananand could not resist her plea, and what was more, sang with his face towards her, and his back towards the Emperor. The song was enchanting, and moved the audience. The Emperor was also thrilled, but while on the one hand he could not help appreciating the melody, on the other he could not forgive the insult; and he turned the Poet out of the city. When he was leaving, Ghananand begged Sujan to accompany him, but she refused. Broken-hearted he left the city and went away to Brindaban where he turned to God and renounced the world. He began to live as a Nimbarka devotee of the Vaisnava cult." It is mentioned by Sri Sambhu Prasad Bahuguna that the two poets, Ghananand and Dev, met in the durbar of Maharaja Surajmal, and they began to argue whose poetry was of the higher order. Ghananand told Dev "You speak of worldly experience, while I speak of my own." Writing about Ghananand in Laksmi Patrika, Lala Bhag-wandin says as follows :"
Anandghan was born in about samvat 1715 (A. D. 1658) and he died in samvat 1796 (A. D 1739). He was a Bhatnagar Kayastha of Delhi, and knew the Persian language well. By tradition he is known to be the pupil of Ab’ul Fazl, Beginning from a small position he rose to be the private secretary of Emperor Mohammad Shah. He was extremely fond of seeing shows of the amorous pastimes of Krsna with the cowherdesses, right from his very childhood. For months together he would get the shows enacted in Delhi, and finance them. Sometime she would take part in them himself. In this manner he got familiar with the Hindi language and also became fond of the company of saints. This set him on the way to writing poetry. Gradually he acquired a skill in his writings which was outstanding amongst Hindi poets. Even to this day his verses are sung in ras lila parties. The accounts of the loves of Krsna had such a- great impact on Ghananand that he starred getting completely absorbed in them. Soon he left the durbar and his family, and went away to Brindaban and being initiated there by a Vayasa saint, passed his days in prayer and worship. He used to live somewhere near a tree associated with Krsna and would for long hours sit lost in meditation, Sometimes he - used to spend days together in this manner. Sujdn Sagar was written while he was in Brindaban." In the account given by Sir George Grierson also, there is no mention of the courtesan, Sujan; nor is there any mention of Ghananand’s being private secretary to the Emperor, Thus we End two hearsay accounts about the Poet. According to-one he begins as the lover of a courtesan and later turns his love towards God, and according to the other he remains a devotee of God right from the beginning. The former account appears to be nearer the truth, for we do find clear mention of the Poet’s love for Sujan in his verses. His being private secretary to the Emperor is rather doubtful, for if he occupied such a high and responsible post there would have been some mention of it in the historical documents of his time. His name does not find place even in the personal diary of Emperor Mohammad Shah. Quite possibly he was just an ordinary citizen of Delhi. The Misrabandhu Vinod has the following account of the Poet: "People think Ghananand to be the lover of a courtesan. This Ends full support of his verses. But it appears that with the passage of years he became disillusioned and detached from worldly things, clue to which he went to Brindaban and became initiated as a Nimbarka disciple and took up residence in that p1ace." Birth place—Nothing is conclusively known about Ghananand’s place of birth. jaggannath Ratnakar thinks his birth-place was in district Bulandshahr. According to Sri Sambha Prasad Bahuguna he was a resident of Kot in Hissar. Another possibility is that he belonged to some small township in Bulandshahr district, in the area in which the language of Braj was spoken. 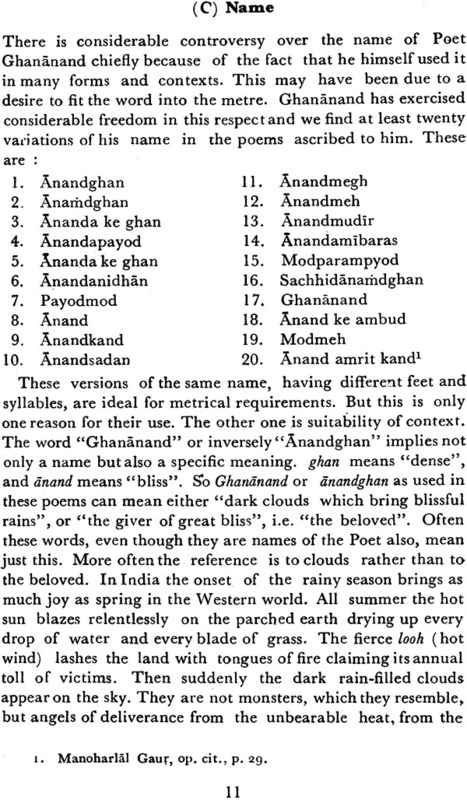 This conclusion is supported by the diction and language used in Ghananand’s poems. Manoharlal Gaursays, "Sometime after his birth it appears he went to Delhi. He was a Kayastha and an expert singer. He fell in love with a courtesan by the name of Sujan. One day the Emperor Shahanshah Muhammad Shah of Delhi asked the Poet to sing in his court, but he was such a vain and moody person that her efused to sing even at the command of the Emperor, and when his beloved Sujan made the same request he sang with such a great fervor that the entire audience was thrilled. The Shahanshah got annoyed with him and banished him from the city. Leaving Delhi, the Poet got initiated into the Nimbarka cult and began to meditate and pray in the sakhi-bhav: manner. He was very friendly with other saints, like Nagridas and Savant Singh the Maharaja of Kishangarh. "1 With them he went to Jaipur and other places. Ghananand was very fond of kirtan, and formed a kirtan party of which Haridas, Badridasa, Mtirlidas, and other savants were members. Nagridas was a great admirer of the Poet. He looked on him with respect and had much praise for his pious company. In Brindaban the Poet lived for a long time at Gokulghat on the banks of River Yamuna. He held the soil of Braj sacred, and according to popular tradition it was this soil which he scattered in the face of his invaders ere they slew him. He believed that the dust of Brajwas holy, and by merely applying it to the eyes one could have a vision of Krsna and Radha. He also lived for sometimes in Nandgaom. Thus we can imagine the reverend Poet dressed in saintly robes and wandering in silent contemplation in thelanes of Brindaban. Nature—Ghananand had experienced the highest rapture of Samadhi Savants of the fame of Nagridas respected him greatly and were desirous of his company. Wandering amongst the people of Braj, on the banks of the Yamuna, he would sometimes, laugh and sometimes weep. He experienced union with Krsna, and separation from him, constantly in his heart. His eyes would rain tears and his heart would fill with tender-ness. He would wander on the Yamuna bank, and on seeing the waves of the river he would be drowned in bliss. He would repeatedly apply the dust of Braj to his eyes, and look around here and there as one crazy. Waves of emotion would arise in his heart, and forgetting himself he would become absorbed in love of God. Tradition has it that the Mohammadens slew him. As soon as the wounds made by their swords appeared on his body he rolled in the dust of Braj so pure and sacred he held it to be.